Exudes a wondrous sense of Dino-awe! In 1993, Jurassic Park released in cinemas around the globe. It imagined a world where dinosaurs could once again roam the Earth courtesy of breakthroughs in genetic engineering. The film used cutting edge animatronic and computer generated imagery to bring these extinct and wondrous creatures to life. In so doing, Steven Spielberg’s Jurassic Park went on to capture and influence the minds of generations of people, myself included. Although 25 years have passed since the original film, the Jurassic Park franchise has continued to grow exponentially; with Jurassic World Evolution (2018) being the latest game to use the franchise’s license. Developed by Frontier Developments and originally announced at Gamescom 2017, Jurassic World Evolution is the long awaited ‘spiritual’ successor to Jurassic Park: Operation Genesis (the holy grail of Jurassic Park simulation games). Naturally, the new game puts “players in charge of cinema’s greatest tourist destination – where they will have the opportunity to construct and manage their own Jurassic World”. 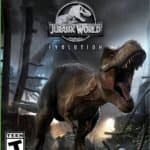 Given the decade and a half long wait for a new simulation game based on the Jurassic Park franchise, many are wondering if ‘life found a way’ and created a game that supersedes the original or fails dismally in comparison? In short, the answer to that question lies somewhere in the middle. 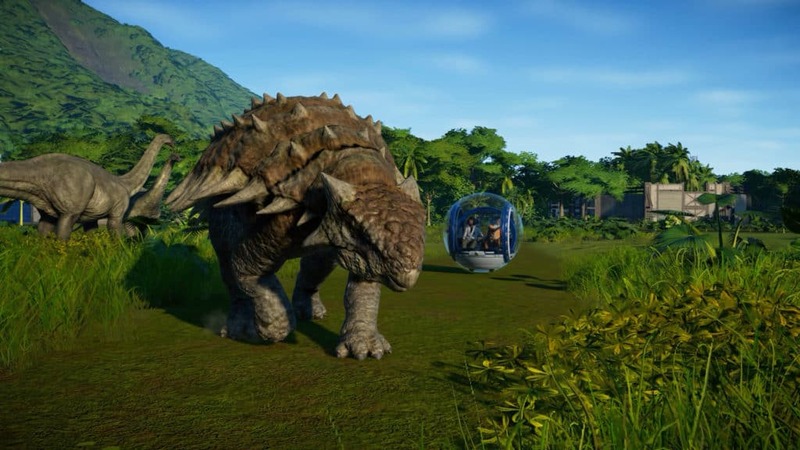 In Jurassic World Evolution, you are tasked with owning and running a theme park with living breathing dinosaurs. Some are as they were originally created, while others are genetically engineered super dinosaurs. No matter which you choose to breed and engineer, the end goal is the same: create a park that guests will adore in order to rake in the cash. In a nutshell, that is the basis of Jurassic World Evolution. As the game begins, the smooth voice of our favourite Chaos Theory mathematician, Dr. Ian Malcolm (voiced by Jeff Goldblum), welcomes you to your new role as park manager. Throughout the game, Malcolm is by your side watching your progress and offering his particular brand of wisdom. Characters based on Bryce Dallas Howard and Chris Pratt also make an appearance, with the latter character quite noticeably not voiced by the actor himself. Unlike Goldblum’s character, however, the inclusion of these characters appears to only serve as tie-ins to the Jurassic World films, because other than one or two unique lines, they do not really add anything to the game – serving as a bit of a missed opportunity. With that said, the game does have several additional characters in the form of Public Relations and Crisis Manager, Cabot Finch, the three heads of the different divisions in the game and, most notably, the infamous Dr. Henry Wu (voiced by B. D. Wong) – a character that adds some much needed intrigue to the game. In keeping with the canon of the films and books, the game takes players to the Muertes Archipelago. This is where ‘The Five Deaths’ (Las Cinco Muertes in Spanish) are located – namely Isla Matanceros, Isla Muerta, Isla Pena, Isla Sorna and Isla Tacaño. These are a chain of five islands that are roughly 320km from Costa Rica and about 150km from Isla Nublar – the island that both the original Jurassic Park and the new Jurassic World theme parks were built on. Fans of the franchise will also know that the Muertes Archipelago is home to site B, Isla Sorna, the location of InGen’s laboratories and the original location where the dinosaurs were bred and engineered. In Jurassic World Evolution, you are tasked with visiting each of the islands in the Muertes Archipelago. Your ultimate goal is to create a successful ‘Jurassic Park’ in each location. Although the game lacks any kind of a true campaign, it does have a series of missions that link the player’s progression through designing and running several dinosaur filled theme parks. The main goal on each island is to effectively run and manage a five star resort. Doing so allows the next island in the chain to be unlocked. Achieving this goal, however, can be quite a challenge, especially when you have to micromanage splicing dinosaur DNA, severe weather conditions, sabotage, island space constraints, dinosaur illness and dinosaur comfort. Dinosaur engineering is one of the core elements at the heart of Jurassic World Evolution. Once a park has both a Research Centre and an Exhibition Centre, the dinosaur creation process can begin. With over 42 dinosaurs to excavate and breed, including new hybrids, there is a dinosaur for almost everyone to enjoy. In order to breed a new dinosaur, you need to excavate fossils for DNA extraction. Once enough DNA has been obtained, the specimen becomes viable and can be brought to life in the Hammond Creation Lab. The more complete the genome, the more modifications can be made to the dinosaur. These modifications allow customisations to the dinosaur’s appearance, health, defence, attack, resilience and overall rating. The higher the dinosaur’s rating, the more popular it will be (resulting in a higher cashflow). At the start of the game, this process can be quite slow and tedious; with only one dig team being available (dig teams, like research and breeding times, work in real time within the game). However, as the game progresses, and as different rewards and research tiers are unlocked, the process becomes quite quick through the addition of building modifications that allow for processes to run faster and cheaper. It just takes some patience to get to that point. Patience that is often tested by Jurassic World Evolution’s three branches of management. On each island there are three core management branches that gamers must focus on: science, entertainment and security. Science focusses on research and creating new dinosaurs, as well as simply looking after them, how they live, and allowing them to thrive. Entertainment is all about creating the world’s best theme park, with dinosaurs being the main attractions in the park. Security is focussed on how deadly you can make the dinosaurs, but then also ensuring that the dinosaurs remain in their paddocks and do not consume guests. 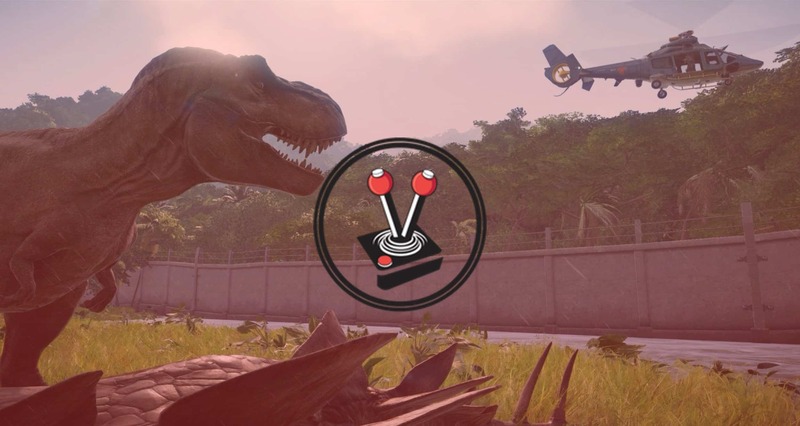 Unlike traditional simulation games, whereby players can choose to focus on one particular management branch over another, Jurassic World Evolution forces players to dabble in all of them. Each division has at a least one main mission per island, and several other optional missions. These missions result in new rewards for the player to use (unlocking new dinosaurs, different genetically modified skin variations, new paddock walls, etc). However, in order to gain access to these unique missions, players must first increase their reputation in each division. This is achieved through completing a variety of randomly generated contracts: for example, taking a picture valued at over $5000 or discovering a new ‘small herbivore fossil’, among many more. Players can choose which contracts to accept and may also request new contracts. A total of three contracts may be active at any one time. Unfortunately, after several hours of playtime, these contracts become fairly repetitive and make maintaining a balance between the divisions quite a challenge. This is partly because each contract has values that increase or decrease your reputation amongst all the divisions, not just the one the contract is for. In addition to this, some contracts can be completely unattainable (I think this may be a bug). There are moments, for example, where a contract would ask me to breed a particular dinosaur that is still locked behind a dig site that is not yet available. Worse still, are the main division progress missions that require certain dinosaurs to be bred with unique characteristics. Even though you might have already met those requirements, simply from playing, you need to meet them again as the mission only counts dinosaurs that have been created once the contract is active (this happened numerous times). Then there are those strange moments when one of the divisions decides to sabotage your park, since you are not giving them enough “attention”. In truth, this aspect of the game is a little odd. Throughout Jurassic World Evolution, each of the heads of the relevant departments – Kajal Dua for science, Isaac Clements for entertainment and George Lambert for security – will pop in with anecdotes about the park. When they do, they will almost always talk about what needs to be done to keep the park safe and in a good working order. Prompting you to always be careful and vigilant. Then, out of the blue, one of them will sabotage the park in the most ridiculous way. Whether that is through poisoning the dinosaurs, cutting the power to the park or opening all of the paddock doors, the end result is the same: visitor casualties. It is a strange design choice to have the department heads, who actively appear to want the park to succeed, to then sabotage the park by causing mayhem that ends up with visitors dying savagely by agitated dinosaurs. I feel that the game would have been far better served with outside factions attempting to derail each park (like a “Dinosaur Conservation Group” or a competitor to InGen looking to steal “genetic secrets”) and then utilising the strengths of each department to fend off the ‘attacks’. Nevertheless, the game in its current form has you consistently micro-managing internal fights between the departments that are supposed to be making the park function. When coupled with repetitive dialogue and missions tasks, these department heads quickly become forgettable nuisances. In addition to the three core management aspects, players who want the coveted five star park rating will also have to contend with visitor satisfaction, disease, weather and, worst of all, dinosaur comfort. Visitor satisfaction, in its current form, is quite superficial. Despite several guests meeting their demise at the jaws of carnivores during a tornado event, for example, the overall park satisfaction and star rating will quickly return to normal once the situation has been handled. Judging by how the game allows for the player to view certain park aspects, such as the food, fun, transport and entertainment needs of guests, it is quite easy to obtain a five star rating by building amenities (hotels, bars, toy shops, monorail stations and more) to cater for their needs (space permitting). I would assume that visitor satisfaction will most likely be further enhanced and become more integral to the success of a park as the game matures. Diseases rarely occur, but do have the ability to wipe out dinosaurs if not dealt with in a timely manner. They only really pose as a threat if the necessary research has not been completed for the diseases that are menacing the park (handy tip: always research diseases first). With that said, they are easily dealt with once the cures are researched and seldom pose as real threats to the parks. Natural disasters are present in the game in the form of storms and tornados, the latter of which can truly cause some despicable mayhem. Although Storm Defence Stations can be placed to help mitigate the damage caused, if a tornado hits you can be sure that pandemonium will ensue. Activating the Emergency Shelters as a storm warning is issued, however, will often preserve the park rating and give you the needed time to manage any damage caused by the storm. It also allows you to reign in any dinosaurs on the loose. Speaking of dinosaurs, the worst part about the weather is that it has a direct impact on dinosaur comfort. Easily one of the most challenging aspects of the game is managing dinosaur comfort. Every dinosaur in the game has several aspects that need to be catered for in order for the dinosaur’s comfort levels to remain in the green. These include basics like food and water, and more challenging requirements like social (how many of the same species must be in one paddock for the dinosaur to be happy), population (total number of dinosaurs that this particular dinosaur can tolerate in one paddock) as well as grassland and forest requirements (the amount and kind of space the dinosaur requires to remain happy). Over all, the systems work quite well. With that said, there are a selection of dinosaurs that are incredible fussy about their paddocks. Even just placing one tree to many, will cause them to rampage and break through the electrified concrete walls (any dinosaur can break these walls, the strongest in the game, including an unhappy Gallimimus – which is just ridiculous). It is also worth mentioning that dinosaurs in Jurassic World Evolution have a ‘comfort radius’. This means that a dinosaur’s comfort level is dynamic. So even if you have created the perfect paddock, should a dinosaur roam to a corner of the paddock that it does not like, the dinosaur’s comfort will drop, and instead of moving away to be comfortable again, the dinosaur would rather become agitated and break free from its enclosure. To be frank, this is more a problem with dinosaur artificial intelligence than it is with the dinosaur comfort system, and I certainly hope it is improved upon as the game matures. Overall, managing crises in the game is fairly straight forward. Have a diseased dinosaur? Make sure you have researched the cure, then assign a Ranger to administer the cure to the sick animal. Is a dinosaur rampaging through the park? Get a ranger to fix the paddock fence, then get an Asset Containment Unit (ACU) helicopter to tranquillise the dinosaur and then issue yet another ACU command to return it to its enclosure. The gameplay mechanics work well, and the controls are very easy to use, especially on console. However, as great as the control methods are, the game is severely let down by some truly unfortunate and frustrating micromanagement. Micromanagement in a simulation game is part and parcel of the genre. There is no question about it. With that said, there is a fine line between when something should be micromanaged and when it is nothing more than an unneeded chore. In Jurassic World Evolution, aspects like searching dig sites and extracting then splicing DNA are interesting and can be done in your own time. These elements are therefore annoyingly repetitive, but still enjoyable because you may do them at your own leisure. What becomes annoying very quickly, however, is needing to manually refill the food supply units in dinosaur paddocks (among many other repetitive tasks). Instead of the Ranger teams automatically refilling food as it is depleted, it is up to the player to do this. The same is true for deceased and diseased dinosaurs, as well as for fixing broken buildings and paddocks. It also applies when needing the ACU to reign in some unruly dinosaurs – you have to manually activate the ACU and manually select each dinosaur. Once tranquillised, each dinosaur must also be manually selected for transport back to their paddocks. Very few things in this game are automated. Almost everything is manually done. 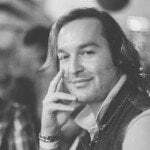 Granted, this design choice was implemented for one very specific reason: the game has first and third person modes that allow players to drive jeeps, fly helicopters and even ride in gyropheres. As fantastic as these third and first person experiences can be, and they really are quite excellent (one of the best features of the game), the issue is that the micromanagement of all of these varying systems can be incredibly frustrating in the long term. Especially when you have a very large park or when your park has just been ravaged by a tornado or a saboteur. Given how players have to manually repair damage from storms, tranquillise escaped dinosaurs, discard dead dinosaurs, move tranquillised dinosaurs back to their enclosures, send archeologists to dig sites, extract DNA, and heal unhealthy dinosaurs; something as simple as refilling a dinosaur feeder begins to feel like to much work. It is simply one more element to consider, one that really should be an automated process; and it takes away from what is actually a fun and engrossing simulation game. Despite some odd design choices for how the divisions work in the game, and how there are practically no automated systems for anything (even feeding dinosaurs), the game has a wonderful charm to it. This is mostly in part to how well the game plays and, best of all, how gorgeous it is visually. 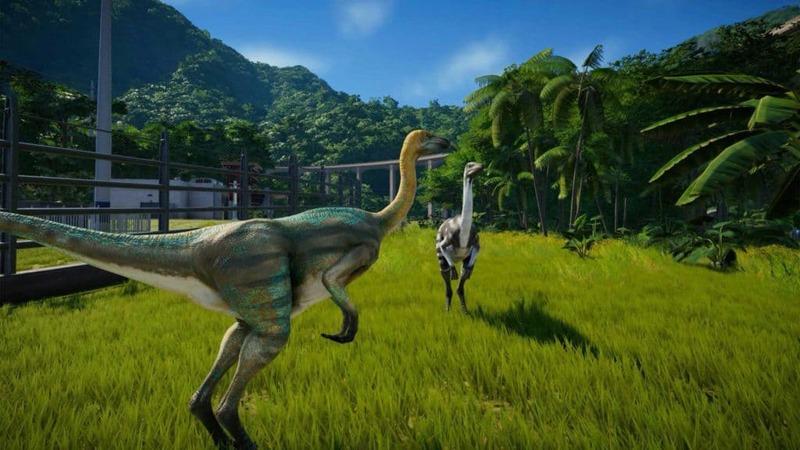 From the way the grass and trees move when dinosaurs pass through them and how shrubs, blades of grass and tree branches interact with the wind from storms and helicopters, through to the wonderful lighting effects that cast realistic shadows and bloom effects on the environment, making the dinosaurs look utterly incredible; Jurassic World Evolution is an absolutely stunning game. At first glance, the game’s isometric viewpoint makes it appear like any other simulation and Real-Time Strategy (RTS) game: clean and modern with some graphical embellishments here and there. When you zoom in for a closer look, however, the game takes on an entirely new visual stance. Simply put, the game is gorgeous. On more than one occasion, I found myself taking control of a Ranger Station Jeep and simply driving around the park. Taking in the scenery of the buildings, paddocks and dinosaurs. Although it is possible to zoom in on individual dinosaurs, and to assume control of Jeeps, helicopters and gyrospheres; I do wish that Frontier would allow us to also assume control of guests in the park for a real ‘hands-on’ viewpoint. It would be fantastic to be able to walk around and use the monorails, viewing decks and even the shops and restaurants as a visitor of the park (it is not currently possible to do this). There is so much visual detail in the game, that I feel as if it is going to waste (restaurants, for example, have menus with text). Given how the game is first and foremost a simulation game, one meant to be played from an isometric viewpoint, the detail is honestly extremely impressive and appreciated. Despite a high level of detail in Jurassic World Evolution, buildings can be fairly bland. Although highly detailed and styled after the Jurassic World films, most buildings only have a single design. This means that every building of a particular commodity will look exactly the same. Unfortunately this means that most parks will look identical to each other, despite a difference in the physical layout of the islands. It should also be noted that the game currently has no decorative elements. A truly perplexing omission given how a staple of park management simulation games is having the ability to add embellishments to the visual style of your park. Again, this omission is most likely due to the game’s rushed development cycle and will most likely be added in a future patch. Naturally, the stars of the show are the dinosaurs and they all look sublime. The texture work is outstanding and so are the animations. Frontier appear to have catered to the smallest of dinosaur details in Jurassic World Evolution. From the way the feet of the dinosaurs expand as they take their steps, through to the way in which their eyes glisten and tongues move; each dinosaur has been created with tender care and expertise. Given this high level of attention to visual detail, I was surprised to find that the immersive quality of the game is marred by repetitive, yet excellent, animations, and especially poor AI for dinosaurs, guests and park staff. 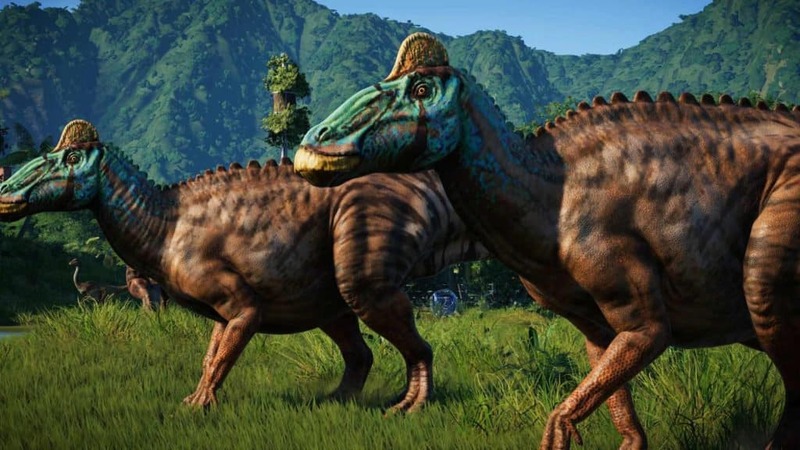 Although each of the dinosaurs in Jurassic World Evolution feature unique physical features and audio, they do appear to share a limited set of animations among the same genus of dinosaur. Although this is by no means a deal breaker, it does ruin the immersion that these dinosaurs are meant to be unique living and breathing creatures. As exciting as it might be to release a Triceratops, Chasmosaurus and Torosaurus together in one paddock, the reality is that each of these Ceratopsian dinosaurs will behave and react in the exact same way. From eating animations to running and even fighting; they all move and behave identically. The same applies to other dinosaurs that fit a particular classification. Without the visual and auditory differences, you would be hard pressed to tell them apart. For a game with so much visual detail, it is a shame that it is let down by what appears to be copy-and-paste animations – no doubt another consequence of a very short development time (roughly 18 months) and is an aspect of the game that I hope will be improved as the title matures. Dinosaur AI can also leave a lot to be desired. Most carnivores, for example, will simply kill anything and everything in sight. Whether hungry or not, they all appear to have an insatiable urge to draw blood. Ceratosaurs are particularly notorious in this regard. The issue with this is that it prevents the mixing of different dinosaurs, and thus paddocks that feature a healthy ecosystem of dinosaurs. Mixing of dinosaurs can be done, but it is very much on a trial and error basis. In my experience, small carnivores can be placed with medium sized carnivores as well as heavily armoured or incredibly large herbivorous dinosaurs. All other herbivores are off limits. Mixing of dinosaurs aside, there also appears to be a lack of herding AI elements. Although some dinosaurs will attempt to socialise with each other, they do not appear to move in packs or herds. This can therefore cause issues with dinosaur comfort levels, especially if the dinosaur has a strict social requirement. A lack of herding mixed with the current dinosaur comfort radius, means that when dinosaurs roam too far away from their own species, they will become agitated and break out of their paddocks. I have had several issues with Parasaurolophus’ doing exactly this. Reducing the paddock size would sometimes clear the issue, but I still feel that if the AI was good enough that it would not be an issue in the first place. Yet another aspect of the game that will hopefully improve in the near future. In terms of the visitors themselves, they do leave a lot to be desired. 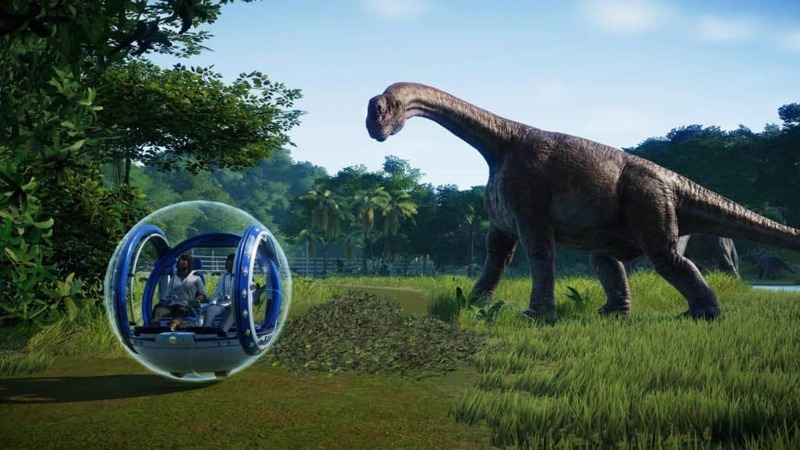 In the game’s current form, visitors in Jurassic World Evolution appear to be nothing more than mindless clones. Clones who will react to dinosaurs with audible gasps, take selfies and always trip before being eaten or trampled to death by a dinosaur (exact same kill animations for all guests). In addition to this, and another odd design choice given the high level of detail for the dinosaurs, is how guests will magically phase in and out of buildings without doors opening or closing. Although this is more of a nit pick than anything else, it is just a very strange omission for a game that includes the tiniest of details for dinosaurs – like how the fleshy part of the foot expands on the ground when a dinosaur walks. One of the bigger concerns for the game pertains to how the AI of the dinosaurs, visitors and park staff work together. Although the AI works well for the most part, there are some really odd inconsistencies that transform the game from being a wondrous dinosaur fuelled park management experience, to being so downright frustrating that all you want to do is throw a controller at the screen. As mentioned before, some dinosaurs can be incredibly fussy about their enclosures. Others will be perfectly happy, but decide to try and escape anyway, leaving a trail of destruction in their wake (they just want the world to burn, apparently). Then there are moments when it is simply easier to take control of a Ranger Jeep or ACU Helicopter and do the job yourself, rather than letting the AI try to refill a feeder, fix a broken paddock wall, administer a cure for a disease or tranquillise a dinosaur. More often than not, you can get the job done in half the time it takes the AI to do it. Visitor AI, on the other hand, is probably the most broken of the lot. When a dinosaur escapes, guests will attempt to run away. The problem is that some will run into the paddock through the broken wall and get stuck there. Only to be killed by a dinosaur at a later stage. Then there are others who will run into an escaped dinosaur, and immediately die – just drop dead from touching the dinosaur. As it stands, none of these issues are ‘game breaking’, per se, simply minor, yet annoying, inconveniences. In addition to the visuals in Jurassic World Evolution, I must commend Frontier on the excellent use of audio in the game. Much like how the dinosaurs have been animated with expertise, the sounds they make have been just as carefully crafted. When up close, you can hear the dinosaurs breathe, snort and communicate with each other. When viewing the park isometrically, you can hear all kinds of roars, hoots and cries from the menagerie of creatures in your purview. Not much beats hearing the hooting calls of a Brachiosaurus or the unforgettable roar of the T-Rex echoing out from the island as you manage the park. It brings a wonderful sense of awe and wonder to the game, offering a subtle reminder that Jurassic World Evolution is doing its best to be the Jurassic Park game that many of us have been craving for years. In addition to how phenomenal the dinosaurs sound, the use of music is just as exquisite. When dinosaurs break out, for example, there is a subtle, unique and ominous track that plays, one reminiscent of when Muldoon realises that the Raptor pen no longer has power in the original film. The game also has a series of, what I assume to be, licensed audio tracks from the films; including the first movie’s unforgettable opening score by John Williams. In terms of performance, the games runs very well on the Xbox One X. There have been some rare moments of frame rate slowdown, but they appear to have been resolved with the latest patch for the game. Loading times are short and navigating the world using a controller is sublime. Although the lack of precision gained when using a mouse can be felt at times (specifically when trying to place a building on the finicky terrain), Frontier have done a superb job of creating a control scheme that is easy and comfortable to use on console with a controller. As a big fan of the Jurassic Park franchise, and someone who has been waiting patiently for a new dinosaur park management simulation game since Jurassic Park: Operation Genesis, I am both pleased and disappointed with Jurassic World Evolution. On a visual and auditory level, the game is outstanding. The dinosaurs are near photorealistic and sound just as good as they look. These factors allow for an unprecedented level of detail and immersion in a game that tasks you with isometrically managing and running a park filled with prehistoric animals. For myself, this alone was almost worth the price of entry. Alas, this immersion is quickly broken with frustratingly repetitive tasks and Artificial Intelligence (AI) that refuses to let the park’s many intricate systems work together without incident (as if Denis Nedry is still alive and well, operating from the shadows). There is no denying that I really enjoy Jurassic World Evolution. It is a game that has a lot of wonderful charm that pulls on the strings of nostalgia from a franchise that, in some ways, has lost the awe that made the original film so unforgettable. From digging for dinosaur DNA through to eventually hatching a new dinosaur; Jurassic World Evolution has a certain kind of addictive magic to it. Alas, it is a magic that appears to have been tainted by a lack of development time. In its current form, Jurassic World Evolution is a good game that has the potential to, in time, be great. With solid and well thought out core mechanics already in place, all the game really needs now is some extra polish. Given Frontier’s heritage and penchant for updating their games years after release; it is safe to say that the game is in good hands. Until then, however, the game’s flaws will continue to erode away the sheen of a title that really has the potential to be remarkable. Next articlePlayStation Plus Games July 2018: Heavy Rain, Absolver & more!